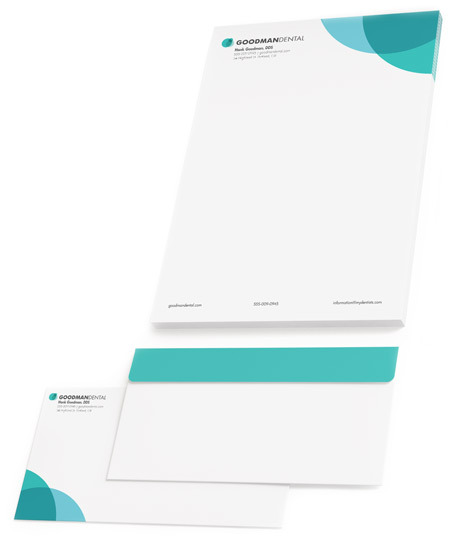 Sleek and stylish, rack cards are ideal for in office communication. Special offers, lists of services, testimonials, before and after photos, say it all on a glossy 4″x9″ rack card! Let your patients know about your new technology or your most recent success stories. 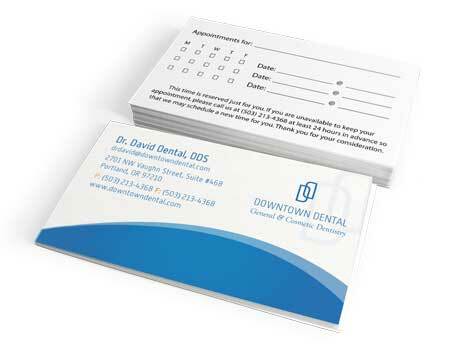 Create a dental hygiene card to go with your patient giveaway bags or a special coupon for teeth whitening. 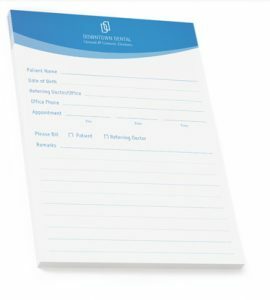 Keep the branding consistent throughout the entire office with personalized notepads whether it is for general use, a referral pad or post-op instructions. These full color custom designed notepads have sturdy chipboard backing and premium quality 70lb text on every page. Let your practice express itself in every manner. Please ask about pricing on various sizes and page counts. Introduce your business in style! Printed on heavy duty, crease resistant card stock, our two-sided business cards are an affordable and professional way to make a great first impression. Say hello in vibrant color with a card custom designed just for you! These durable 2″x3.5″ cards come with a silky matte finish to ensure every printed detail is crisp and clear. Want to stand out from the crowd even more? Ask about our rounded corner feature. Every time you reach out to your patients, you have the chance to make an impression, to say something about who you are and what you do. Printed in full color, our beautiful stationery is custom designed to let your business say a whole lot more than what’s written on the page. With personalized letterhead and matching envelopes, you reassure your clients that professionals always care about the little details. 4″x6″ reminder cards are a great way to let your patients know you care. 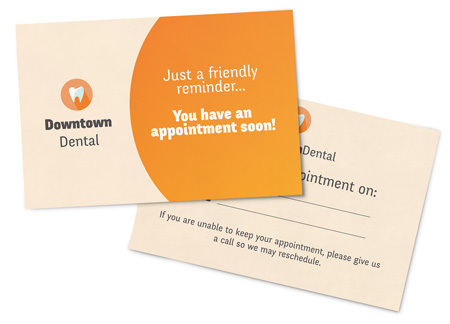 Whether you want to send an appointment reminder or a friendly follow up, these high-quality durable cards let your patients know that their needs matter. Order your cards in laser printer friendly sheets to send out from your office as needed, or for larger campaigns, let us send them for you! These eye-catching 8.5″x11″ brochures can be customized to help any project shine. 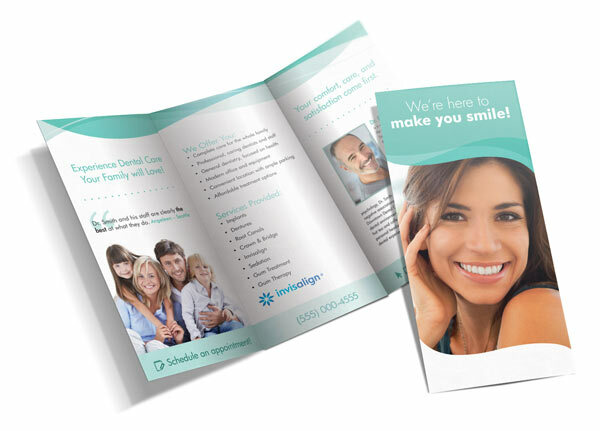 Use an informational brochure about your practice to help your patients get to know you better. 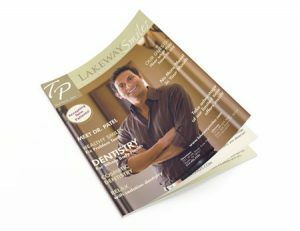 Have brochures designed for each of your procedures and rest assured that you patients have all of their post op care instructions in one convenient place. Let us create a menu of cosmetic services to give your office a spa-like feel or a colorful pediatric pamphlet to set children at ease. 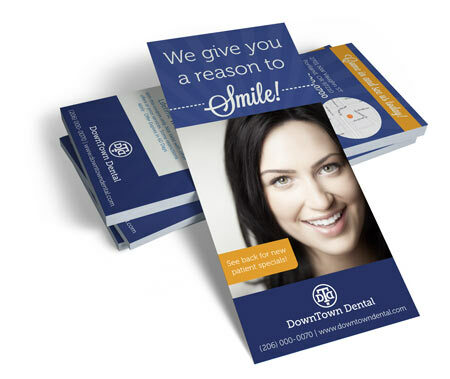 Whatever your practice needs, these full color, two-sided, glossy brochures are a beautiful solution! 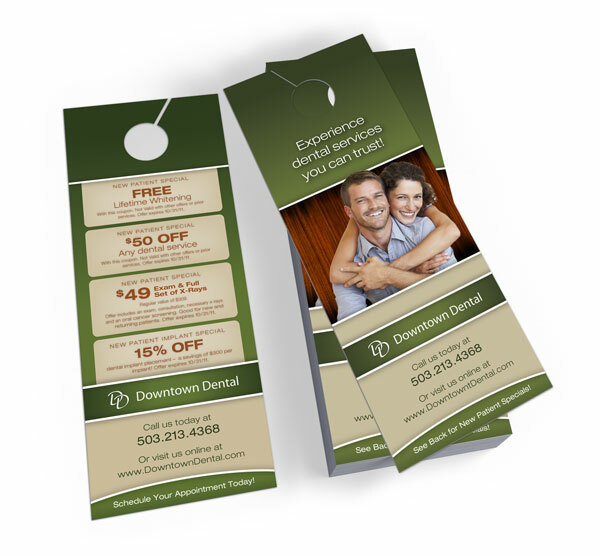 Our beautiful 4.25″x11″ full color door hangers are a great way to target your marketing efforts. Affordable and sturdy, these door hangers are sure to get your message into the right hands.